When troubleshooting a LOW POWER symptom, or a low RPM issue on any high performance marine diesel that uses mechanical fuel injection (meaning NO Electronics, or a true diesel that can run WITHOUT electricity), this is how we go about it (applies in 99 % of the low power / low RPM issues that I have seen). Although much of the same principles apply to the most modern electronic engines, because of the very sophisticated electronic control of the engines’ fuel system, sometimes you need more than a visual of the exhaust output to guide you and get you started in the right direction. Hopefully, these few paragraphs may save you going thru an expensive and time consuming learning curve, rather than following many of the old wives’ tales & typical “dock talk” floating around in this industry that typically always leads you down the wrong road and becomes very costly without even finding the problem. This is where we start (a VISUAL of the exhaust leaving the vessel, under your normal operating conditions): If you are seeing any dark or black smoke during some or all of the operational RPM range, you most likely ARE NOT experiencing a fuel restriction problem. I am going to stress that again. This IS NOT a fuel supply or restriction issue (clogged fuel filters). You are either overloaded during some or all of the engine operational range, or you are not getting enough air (this can be from one or multiple reasons). 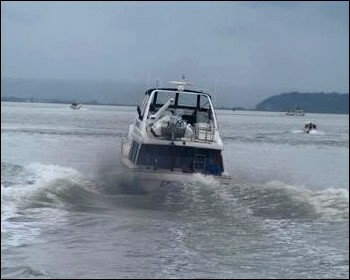 Also understand that on many planing hulls, during the acceleration mode from 9-15K or so (getting over the “HUMP”), some, to more than “some”, black smoke could be perfectly normal as the engine pulls close to its maximum torque during the 10-60+ seconds it may take to get the vessel up on top. This would be dependent on the vessels planing characteristics vs its weight and the HP available. Propping issues: You are OVER PROPPED (overloaded or under powered in the vessel’s current configuration – call it what you like). Regardless of why, being overloaded is directly related to the propeller matching the vessels current running configuration, weight, vessel bottom condition, windage, or running gear issues/conditions, but all of these go back to the prop as they all make the engine work harder because of these conditions, and slow the vessel down overloading the engine. Also, remember the term “external to the engine” as you read further. AIR issues: Not getting enough air can be caused by a dirty/collapsed air cleaner, a leaking turbo hose, a filthy aftercooler or air restriction inside the aftercooler, a worn out or partially stuck turbo, or a poorly ventilated engine room. Any combo of these can restrict air to the engine causing dark smoke and further, low power. Maybe it’s just one of your engines (like it’s trying to carry all of the load or won’t catch up with the other one ?? It doesn’t matter, if you have dark smoke, it’s because of one or both of the above. 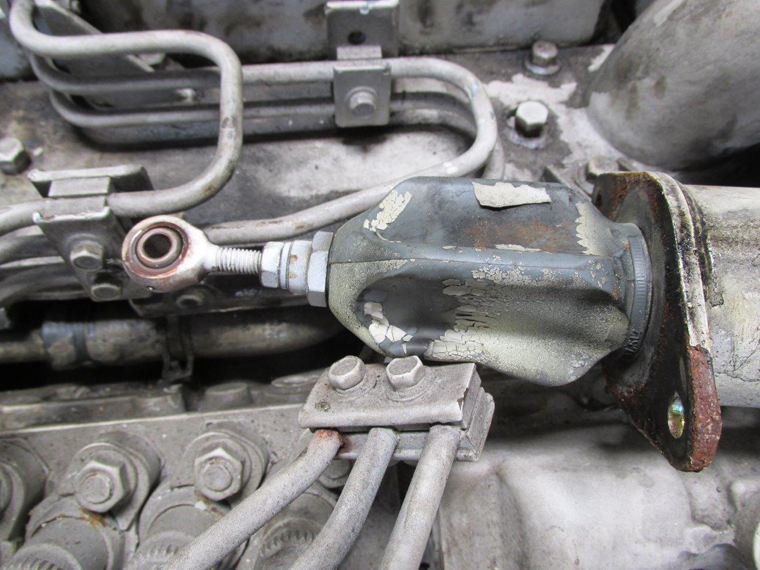 If you have low power or are not getting your RPM, AND you are 100% sure the exhaust color is NOT DARK, then most likely you are not getting enough fuel – this can be from clogged fuel filters, clogged fuel lines and pick-ups, suction air leaks in the fuel supply, out of adjustment throttle linkage, the run solenoid not pulling up the fuel lever all the way, a broken return check valve causing low fuel pressure, bad fuel lift pump, lazy injection pump aneroid, and maybe a few others. All of these can contribute to not getting enough fuel and all are relatively easy to troubleshoot and correct. Checking the throttle or fuel solenoid control linkage (a more common issue than you’d think) itself is super easy to figure out. Adjust or check the linkage or control mechanism until the lever or shaft hits the stop and/or goes slightly into the spring override ( if the injection pump is of that style). This can all be done with the engines turned off, at the dock. Clogged filters are easy to change and if you have a vacuum gauge installed you will “see” the issue. Checking for a bad lift pump or return line check valve usually requires a pressure gauge to be installed some place AFTER the on-engine lift pump. Until you do all of the above, no sense in getting into more complex things like pick-up tube issues or aneroids as 99% of the time, you have already fixed the issue by doing all the above. Have you performed the most basic steps of “Low Power” troubleshooting listed above? That’s NUMBER ONE and until you have ID’d what your true symptoms are that match the above steps, you do not need to go farther. Remember, it starts with a visual of the exhaust color and then it’s either YES or NO as to dark or black smoke. NO HELP & STILL AT A LOSS & WANT MORE? Plus, when getting “over the hump” the boat was spunkier and seemed to do it with a minimum of struggling and a minimum of dark smoke. Now, just all of a sudden you leave the dock a month, two, or three later for a typical trip and the engine seems to have lost its vigor and after getting up to your typical cruise RPM, you seem to be traveling slower. You check things out & push the throttles up to the stops, but you don’t make the same RPM (or speed as before). You are now down to a WOT RPM of 3400 on one engine and 3350 on the other, & WOT speed is only 23-24 K’s. Plus, to make matters worse, at your cruise RPM of 3200, the boat is only making 19.5 – 20K’s. What’s wrong?? Playing with the trim tabs doesn’t help, and next you go for the fuel filters (very typical). Got to be the problem?? No Help !! Anyway, you finish the trip and over the next week or so you start asking around. Does the above kinda fit where we are at this point? If so, you need to read what comes next (maybe a few times) and let it SINK IN. This is where understanding how engines, boats and propellers work in unison, and all together affect how fast the boat travels. 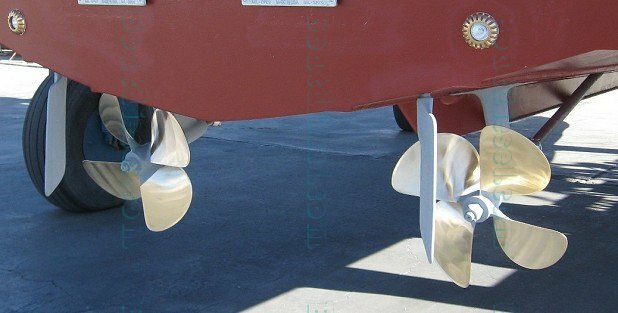 What follows is what I feel is the most important principle of how boats, engines and propellers interact and the single most misunderstood principle in the industry as to vessel performance. And, that even applies to those who are supposed to understand engine and vessel operation – Maybe your “seasoned” mechanic or friendly surveyor qualifies??? The first thing to understand is that your vessel’s propellers move the boat. All the engines are doing is turning them. Spin your props at “X” RPM and the vessel travels at “X” RPM or speed. It’s that simple… Think about it and then think some more, so the most basic of vessel operation has sunk into your head. Now we have to go back again and look at what was happening 6 months ago. Your engine made 3600 RPM and your PROPS were rotating at 1800 RPM (you have a 2:1 gear ratio) making the vessel travel at 28-29K’s, and at 3200 engine speed rpm (1600 prop RPM) your vessel made 22-23K’s. Correct? Again, remember it’s the props that make the boat move forward, the engine is only turning them. Now it’s today and we have the same engine and we are at the 3200 RPM with the same props turning at the same 1600 RPM, but the boat is only traveling at 19-20K’s.. Hmmmmmm ??? Let’s think long and hard about what is really going on. The props move the boat !! The engines are just turning them at the same RPM. But the vessel is going slower at this SAME RPM. THINK AND THINK SOME MORE!! The Answer: It’s not a fuel supply issue (clogged filters, air leaks, etc, etc). It’s not injectors. It’s not the turbo. In fact, to put it bluntly, IT’S NOT an engine related problem. 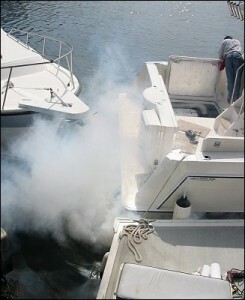 It’s a BOAT ISSUE, or a problem that lies EXTERNAL to the engine. Remember a few paragraphs back I said to remember that term? If this still does make 1 + 1 = 2 to you, let’s look at it this way. 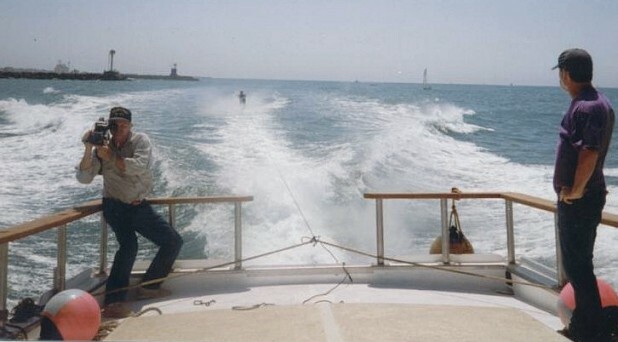 If the props are still turning the same RPM but the vessel is going slower, it’s no different than the following example – Your are cruising along at 22’ks at 3250 RPM with your 100 gallon bait tank full of water and bait ‘ “loaded as you use the boat” – You start dumping the 800 lbs of water and over the next 4-5 minutes you stare down at your vessel speed and now you are averaging 23-24 K’s, yet your RPM is still at 3250. If you had a boost gauge you would have seen your boost was higher before you dumped the water, yet after losing the 800 lbs you are traveling faster and your boost is down a pound or so. If you had pyrometers, they may be a tad lower temp than before. How could that be? Simple, the engine is working easier as you have REMOVED something external to it—WEIGHT in this case. Now start filling the bait tank and watch the opposite occur – Prop RPM the same, but the vessel slows down a knot or two, and the engine is now working harder again at that same RPM. The same thing applies to other things that affect engine performance and vessel speed at equal RPM’s as before – Bottom condition, prop condition, windage, and of course, any type or amount of ADDED weight. And once any of these EXTERNAL FORCES can get to a point to where you are past the maximum HP the engine can produce (at any RPM) , you are now in an OVERLOADED condition caused by something EXTERNAL to the engine – This is a VESSEL related issue, not an engine related issue and since we are trying to understand these external forces that affect the engines performance, a propeller is the main force that is external to the engine. If you CAN’T buy into this, then my answer is also very simple. YOU ARE IN DENIAL, and lack the most basic understanding of how a vessel’s performance interacts with the engine’s capabilities. And if your mechanic is still picking away at your back pocket replacing injectors, rebuilding turbos, etc, then you are in “double denial” and your mechanic, surveyor, friend or ?? is a buffoon as all you had to do is understand what you just read “propellers move boats – engines only turn them”. Strobed your engine and certified tachometer accuracy?. This should always be done and done when you first start using your boat, especially if performance was a key part of the reason you bought the boat. In so many words, an accurate tachometer reading, paired with the manufacturer’s power curve data and ratings, is the starting point for ALL engine & vessel operation parameters. 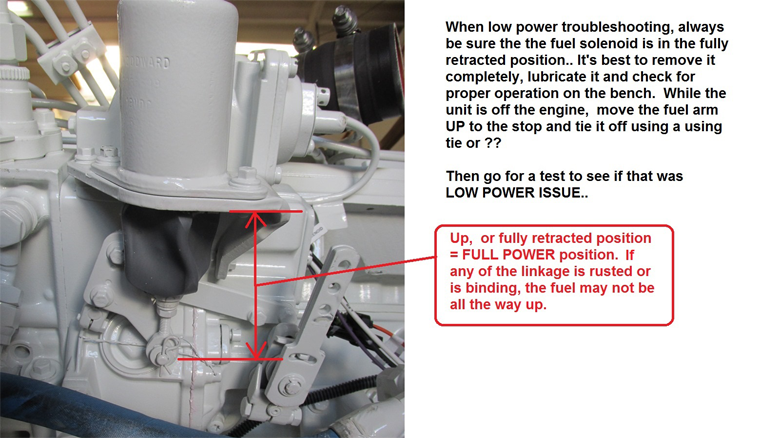 Confirmed that the fuel stop or solenoid lever, and throttle linkage are 100% into their respective stops when at WOT? This basic mechanical check is overlooked quite often with $$ being spent unnecessarily more times than you really want to know about. And, for the guys who want the very most they can get from their engine without going over the edge – Have you considered installing a boost gage (power) & pyrometer (safe cylinder temps) ? – this is the ONLY way to gauge horsepower & the engines safe operation output outside of having accurate instantaneous fuel consumption gauges. These gauges can be super important tools to allow you to have baseline engine performance data for now and for later when you start having issues. If maximum performance is part of your agenda, consider installing these gauges and learning what they are telling you as it’s money & time well spent. Installed BOTH fuel vacuum AND fuel pressure gauges, and recorded results at speeds in gear and out of gear above 1600-2000 RPM when you think you have a fuel supply issue? Most mechanical engines allow you to do this at the dock in neutral. Although a vacuum gauge is much easier to install, it does not always tell the whole story. If you can’t make the needed fuel pressure after the engines lift pump, it won’t matter if the vacuum gauge is giving you a GREEN light (and many times they do). Installed a clear line with a loop in it just before the engine in case you think you have an air leak?? Measured exhaust back pressure? (This is a low number typically measured in inches of water column or MM of Hg (usually in the 1/2 PSI – 2 PSI range if you think “PSI”). Turbos can slow down with age and /or wear (excess pressure over time), and from saltwater getting to them because of a poorly designed wet exhaust system. All of these can cause dark or black smoke affecting the engines overall performance (lack of air), and all may happen over a period of weeks to months. If you had installed a pyro, most times you’ll see this coming. Peeked at return flow to insure it generally matches the spec sheet as to total fuel flow??. Most mechanical engines in neutral and at higher RPM’s will show close to 90% of maximum fuel flow going into the return line. Checked injection pump timing?. Not a likely issue unless someone has R&R-ed the pump, but something that can be a prudent thing to do after all of the above have been performed. NOW, to move on, a trial run or mini-seatrial is important to “see” how the vessel runs AFTER these simple steps are gone through so many times the vessel operator does not really “see” what is really happening but only knows the power is low in comparison to some earlier time in the vessel operation. When an engine has low power complaint issues or symptoms, and these steps are by-passed (expensive mechanical parts are changed/rebuilt before these most basic operating parameters are checked) it’s far from the smart way or cost effective way to go about finding the problem. The order in which I listed them would be close to how I would go about finding the issue, unless I saw something on a sea trial that appeared likely to be the problem. This is where a truly experienced and passionate mechanic can really make a difference, and IMO, you will rarely find one of these that does not work for himself. In so many words, a “factory certified” mechanic doesn’t hold much water in my book if he is still working for a major engine distributor as all they seem to think is to be sure they get the needed “billable hours” when they return to the shop. Solving the “reason” to the issue is usually not part of their plan. But replacing parts is always part, regardless of “WHY”. How much crankcase by-pass you have at 1000 RPM in neutral vs at 2000 RPM+ in gear so I could get a feel for the general condition of the engine, AND…. Confirming the color of the exhaust smoke during any type of “performance lagging” condition……. Hopefully all of the above will help you diagnose the issue quicker and cheaper. REMEMBER, that in just about every case if you have any dark smoke, it’s not a fuel restriction issue or under fueled condition. As to injector issues which always seems to come up with inexperienced mechanics or ones looking to make a quick & easy buck, that’s just about never the issue unless you know water went thru the system. And then, it’s just about always, tons of WHITE smoke. If we were to talk about a specific and very popular engine, the Cummins 370 Diamond, IMO, AN ACCURATE 3100 RPM loaded for bear is the minimum you should see, but we prefer 3125-3150. And, BTW, this same 100++ RPM over-rated RPM is a must for any engine in this class (50-60+++ hp per liter). Remember, as the HP per liter climbs, then being able to reach over the minimum rated RPM becomes even more important IF you want decent engine life and want maximum performance out of your engine. If you have a later electronic engine with accurate fuel and % of load data, then instead of using my rule of 100++ over rated, you have to compare the total fuel consumption at the engines RATED RPM (print out the manufacturer’s performance curve) vs what you have on your digital gauges. If your HP per liter at rated RPM and load is above 60 HP, IMO you never want to be propped to have the engine burn more than 95% of its max fuel burn at its exact rated RPM. Load % should also be at 95% or less at rated RPM but may show 100% at WOT as your engine will exceed that rated RPM by 30-60 or so depending on the electronics and programming of the engine. 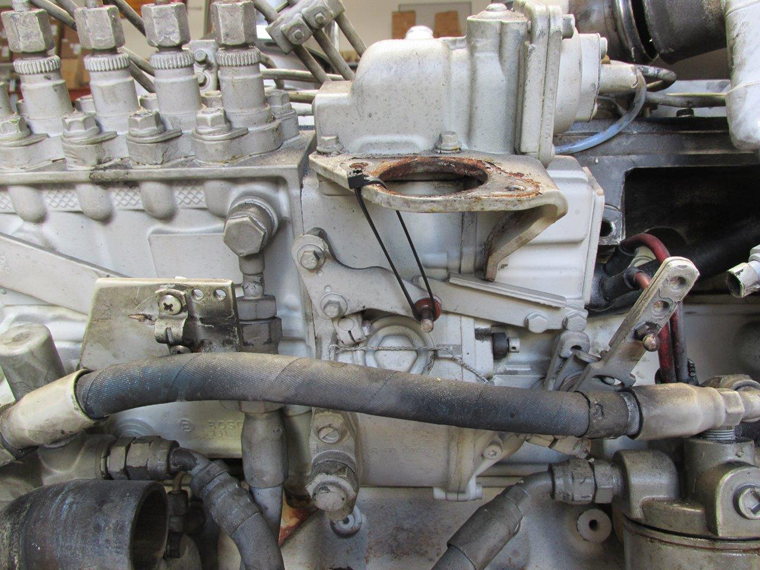 A touch more tricky to understand in some ways, but because of “digital gauges” with a little understanding and homework, you can prop your vessel for maximum performance while also being sure you are not going over the edge on these very high performance marine diesels.